A visit to the San Siro on a match day provides countless lasting memories to take away – and some of them have nothing to do with the quality of the action on the pitch. Chief among them is the frenzied atmosphere that can be found at many stadiums across Serie A. From flags and flares to songs and celebrations, everything is done with passion. Given the fanatical home support, it is easy to see where Paolo Maldini, Alessandro Nesta and company found that extra motivation to chase domestic and, in particular, European silverware year after year. Nesta has since left AC Milan behind – but he is finding a little piece of Serie A in Montreal, where the Impact have attracted rabid home crowds and are on the path to recreating a version of the San Siro magic. Saputo Stadium holds just over 20,000, a far cry from the San Siro’s capacity of more than 80,000, but the club’s Ultras are giving Nesta, Marco Di Vaio and Matteo Ferrari a taste of home. 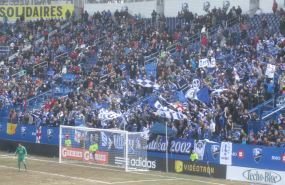 Congregated behind the goal that the Impact typically defend in the first half, the Ultras are considered the true diehard supporters; always in full voice with banners and flags aplenty. They lead the chorus of chants and, in a recent game against Columbus Crew, even caused a stoppage due to the quantity of paper streamers that ended up in the Crew’s goalmouth. For 45 minutes, their mission is to do everything possible to unsettle the opposition goalkeeper and defence. It is no coincidence that the Impact have produced some of their finest moments when attacking that end of the stadium. As for the 2013 season, so far, so good. The Impact have made a fine start to the new MLS campaign, benefitting from full pre-seasons in Montreal for Nesta and Di Vaio (both of whom arrived at different stages during last season). Under new boss Marco Schallibaum, who previously played and coached in his home country of Switzerland, they recorded four wins from their first five games, including eye-catching victories in Seattle and at home to New York, and have established themselves as legitimate contenders for the MLS Cup in November. President Joey Saputo admitted that the club have always wanted a multi-lingual European at the helm, which makes sense given the number of players with a background in Italy or France, for instance. Schallibaum appears to be an ideal fit, given his linguistic skill set (French, English, Italian, German) and eagerness to entertain the fans with a winning style of play. "As a coach I like to attack – to go after victories", the former Swiss international explained. "It is better to have the ball than to chase after it. My style is more offence than defence." Montreal, a city where ice hockey has long been the only sport that matters, is gradually embracing the Impact – and "soccer" as a whole. With a large European presence, including more than 250,000 inhabitants of Italian descent, it was previously typically the World Cup or European Championship that stirred mass enthusiasm, flags, banners and so on. But the Impact’s rise into the MLS and the club’s success in attracting marquee names have brought supporters flocking, with reports suggesting that roughly 50% of the club’s fans are aged between 18 and 35. It is easy to forget that this is just Montreal’s second season in the MLS whereas Toronto FC, who are yet to reach the post-season, are in year seven and are currently in a rebuilding phase. The 2013 campaign is still in its infancy but Montreal are unquestionably among the contenders, with a solid spine that flows from Nesta to underrated midfielder Patrice Bernier to captain Davy Arnaud and Di Vaio in attack. Securing a high playoff seeding will be the focus, ensuring that the Impact earn second legs at home rather than on the road. With the Ultras rocking one end of the stadium, that could count as a major advantage. While Di Vaio has hinted at extending his contract beyond the end of 2013, this is expected to be Nesta’s final year in the MLS. With the Impact blossoming and the Ultras providing a Serie A flavour, the legendary defender has a chance to bow out with yet more silverware.